Two houses built in the middle of nature on an surface of 7 hectares. Located at the foot of the mountains and just seven kilometers from the beach. There is also a swimming pool, barbecue house and various large terraces. built area of 370 square meters. Under the house is a large basement. surface of 32 square meters each. A library / office of 23 square meters. Two storage rooms of 11 square meters. house with a total built-up surface of 150 square meters. The terrace with mountain view is 24 square meters with BBQ area. There are three bedrooms with an average surface of 14 square meters. Two banjos of 4 square meters. The living room with kitchenette is 37 square meters. 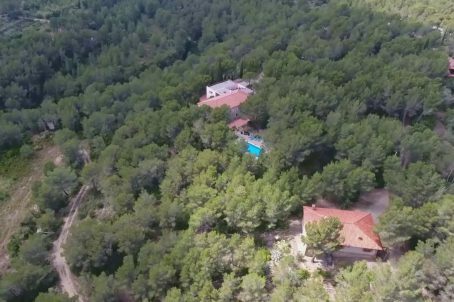 In addition to the fantastic natural environment in which the houses are located and the tranquility it offers, there are all the facilities you need in the neighboring village of Mont-roig del camp. You have a health center, supermarkets and shops of all kinds and schools for the children. The infrastructure is very good and offers easy access to various roads, so that you can reach the beaches of Cambrils and the cities of Reus and Tarragona in about 15 to 30 minutes. For nice daytrips on country roads with the car we advise you to visit the wine route of the Terra Alta region, the route of the Cistercian monasteries or a trip to the Parc Nacional d´Ebre. To make rugged mountrain trips there are other possibilities, like renting a Quad or participating in Jeep-safari´s which they organize here in the area. Hikers can find a network of very old mountain paths which start at our house and still are in use by shepherds with their flock. Go cycling to relax or as a challenge: for everybody there are suitable routes to do. Do you want to explore the surroundings on horse-back ? No problem, the horse riding centre is a few kms away. Even climbing and canyoning are possibilities in the area.